Virotherapy keeps stirring a lot of talk. Some say that this treatment needs further investigation. Some find it way more favorable compared to conventional medicine. There are too many opposite opinions that can easily mislead you. For you to make personal judgements, we have collected the most widespread virotherapy questions down below and provided concise answers. Here is what you may be willing to know before applying for the Rigvir® therapy for kidney cancer. What is virotherapy all about? Virotherapy is a cancer treatment based on oncotropic (being attracted by tumor cells) and oncolytic (targeting cancer cells to infect and destroy them) viruses. It may be used along with radio and chemo therapies thanks to its minor side effects like fatigue and a slightly feverish temperature. Is Rigvir® a good fit for kidney cancer? Despite Rigvir® is primarily intended for melanoma and sarcoma patients, kidney cancer belongs to the second group of the Rigvir®-sensitive diseases together with bladder and stomach cancers. So the Rigvir® for kidney cancer can prolong lives, as it does for stomach cancer patients (3rd stage stomach cancer patients have a 5-year survival rate in 47-60% of cases). Does Rigvir® kill only malignant cells? Yes, it affects only them without doing any harm to healthy tissues. Rigvir® is based on a natural virus, ECHO-7 (Enteric Cytopathogenic Human Orphan” virus no. 7) powered by a strong immunomodulatory capacity. It means that the virus stimulates a human body to resist cancer in a natural way. Discovered in the kids’ digestive system, the virus has not been genetically modified. On top of that, ECHO-7 has proved to be non-pathogenic, which is why it does not replicate itself as time goes by. Has Rigvir® been clinically tested? Yes, the medication ran a series of clinical trials between 1968 and 2004. Over 700 patients suffering from the late stage melanoma and gastric cancers were examined. The results received exceeded expectations. On average, the survival rate increased and ranged between 3 and 5 years in 47-78% of cases. Later, it was discovered that Rigvir® can be applied to a much wider range of cancers including kidney cancer too. What are the most common virotherapy side effects? As we mentioned above, Rigvir® has insignificant side effects that result in a slight increase in temperature (99.5 °F/37.5 °C) which returns back to normal in three days. Additionally, Rigvir® can cause fatigue and sleepiness. Still, it does not mean that the medication is well-suited for kids. It should only be prescribed to adults over 18. How long does it take to evaluate a cancer case and know whether Rigvir® can help? It takes up to three days for the Latvian oncologists to define whether you or someone you love can qualify for the virotherapy. Once the decision is made, you will be notified right away and given further instructions to follow. Is Rigvir® a legit medication? Yes, it was officially registered in Latvia in 2004 and since then the medication has been approved by two more countries, Georgia (2015) and Armenia (2016). In 2016, the manufacturer won the European Commission grant, Horizon 2020, to make the Rigvir® virotherapy available to the EU member countries too. 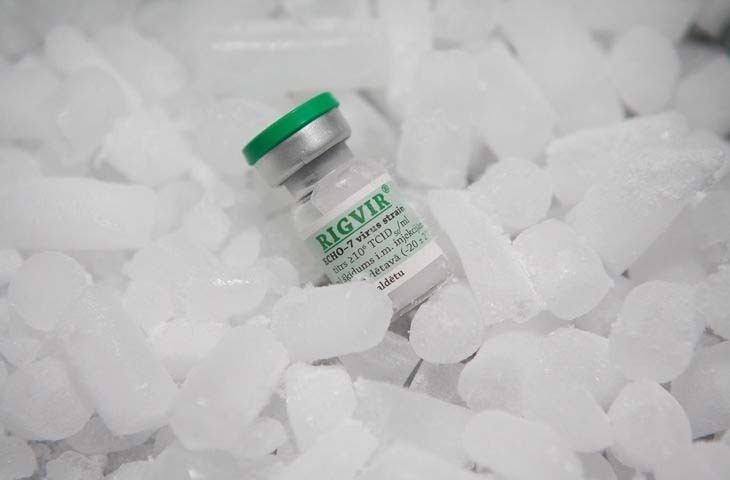 Also, Rigvir® can be shipped worldwide including the US, the UK, Australia, Canada, and New Zealand. How to qualify for Rigvir®? The medical staff in Latvia has more than 30 years of experience, so you are sure to be in good hands. If the case is too tough, the Latvian Chief Oncologist is the one to tackle the issue. Kindly note that the list of the medical records to submit stays the same whether you are looking for Rigvir for melanoma or virotherapy for colon cancer. So far you may still have pending questions regarding the number of Rigvir® vials you may need, additional costs involved into the therapy and more. To dispel all your doubts just click the red button below and we will respond to you within 24 hours at latest.